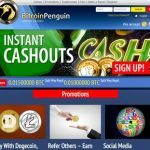 BitcoinPenguin maximizes the chances to win larger payouts by accepting BTC, LTC, and DOGE for a fun-filled cryptocurrency betting online worldwide. 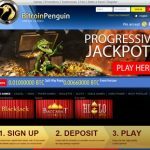 BitcoinPenguin is an online casino that primarily accepts Bitcoin, but it now also supports other cryptocurrencies like Litecoin and Dogecoin. 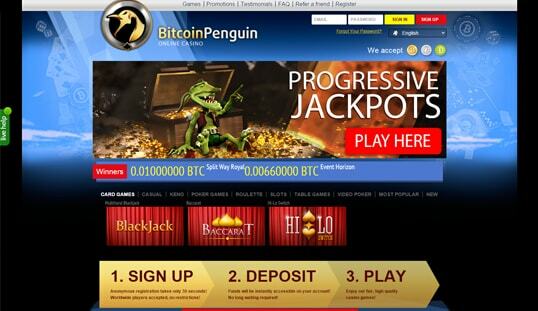 It is powered by the SoftSwiss Bitcoin casino software, one of the best solutions online, and it exudes a promising potential to make it in the top Bitcoin gambling sites through its reception of the myriad of players from all parts of the globe. It made its debut in the iGaming industry in 2014, and was granted license to legally operate under the government of Curacao, making it one of the most trustworthy Bitcoin casinos even up to today. 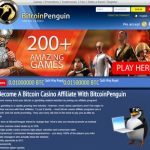 This Bitcoin casino started with only 32 games developed by SoftSwiss, but more than 200 titles are now available in its library since its launch. With more variety in the gaming aspect, players should expect more opportunities to boost their wins while experiencing quality entertainment. Bitcoin slots, roulette, video poker, and blackjack are just some of the staple casino games ready to be played using any of the three supported cryptocurrencies. 3D and HD slots are also at hand, together with the vintage slots, jackpot games, and casual games. SoftSwiss is one of the best online gaming platforms on the market today, and having this on board already makes this Bitcoin casino a candidate to be among the best gambling sites in this niche. 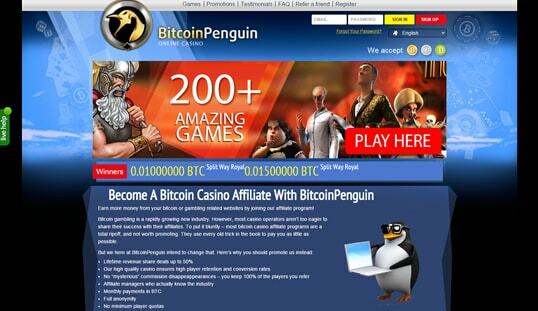 Other than the technology and games provided by SoftSwiss, BitcoinPenguin also outsources games from BetSoft and Amatic. The combination of the high-end 3D graphics and vintage themes create a variety that complements the casino. Player anonymity is a key feature highlighted here since only a valid email address, password, nickname, and preferred currency are needed for the registration to push through. However, inputting a working email address is essential because the confirmation email will be sent there for the activation of the account. Another plus for the players is the freedom to change the desired currency after signing up. Those who wish to not register yet can choose to play for fun, instead. IDs, documents, and other details are unnecessary when depositing to or withdrawing from this casino. Both transactions are automatic and take minimum amount of time, but all withdrawals must not exceed 5 BTC, 100 LTC, and 2,500,000 DOGE. Cashouts of larger amounts can be done through multiple requests. High rollers are bound to receive 0.5 BTC for every 1 BTC they deposit. This bonus is automatically granted to select players that meet the requirements. 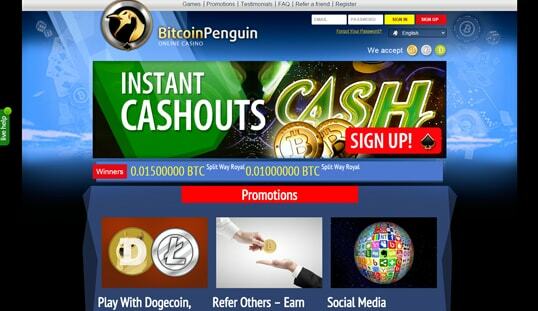 Moreover, it can be claimed numerous times, so long as each deposit is at least 1 BTC. While this is the only staple Bitcoin bonus offer, promotions are sometimes launched on its social network accounts, so players are advised to always check for announcements. The favorite Bitcoin slots and other games are available on mobile, but only selected games in this Bitcoin casino are playable when accessed using a smartphone or a tablet. Since it is optimized for mobile gaming, the casino allows its registered players to continue their winning spree wherever they go. BitcoinPenguin provides its members with two ways to voice out their concerns and issues. One is through the contact form, which requires an email address and the message, and the other is through the round-the-clock live support. Its real-time customer service is designed to narrow down inquiries to certain topics: deposit, account verification, withdrawal, technical issues, and bonus/promotions, to name a few.